Ubbu Roti is a Rice Roti made with leftover rice and blended with rice flour. After cooking this is again cooked over the direct flame to get a rustic roti taste. When I made Ukkarisida Akki Roti from this site, I came across Ubbu Roti and my U was fixed by then itself. While both the rotis are made with rice flour, Ubbu Roti is different in what it is made. Leftover cooked Rice is taken and mashed well and to that is added Rice flour as required to form a dough. After that, it is rolled and cooked over the direct flame before serving hot. I think with Ubbu Roti, I have covered all types of Rice Rotis made across the Indian States. While I had made a spicy Brinjal Gravy with Ukkarisida Roti, I made our favorite Groundnut chutney and it went really well. There is nothing else to select when it came to U other than Urad Dal. I know I have done all types of Urad Dal parathas or Pooris. So it was decided it is going to be Ubbu Roti in the AtoZ Flatbread and More, where I am doing AtoZ Indian Flatbreads. 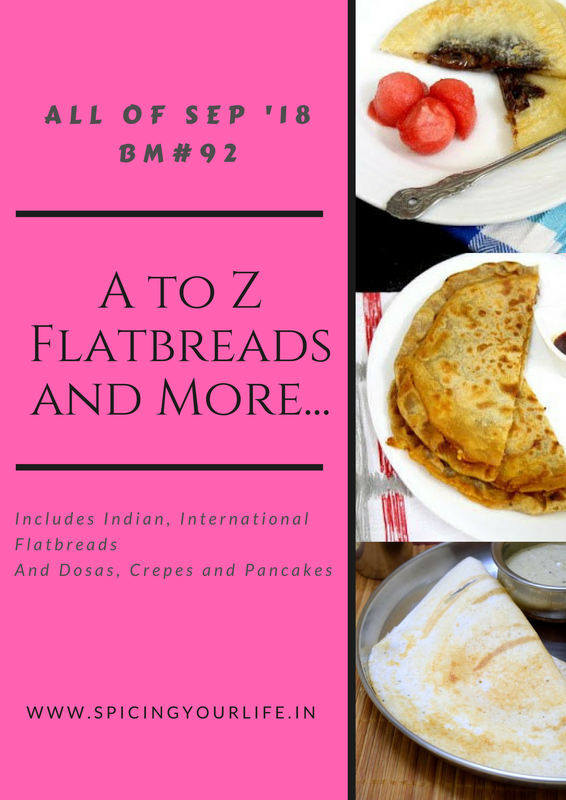 If you are keen to know what’s U in the AtoZ Dosa Varieties, check it out. In a bowl, take the cooked rice and mash well. Then add the rice flour and blend well to form a dough. Take the dough and knead well. Add oil and continue kneading till the dough becomes soft and pliable to handle. Divide the dough into equal balls and dust well. Using a rolling pin roll out to 3 to 4 inch discs. Heat a nonstick pan and cook the roti on both sides. Then cook it directly over a high flame for the roti to puff up. Serve with your choice of side dish. I love this idea of using leftover rice to make rotis. And now that you have completed the rice rotis from across the country, I need to plunge into that collection and explore them all. Fabulous pick!! Thats an incredible rice roti, nice idea of finishing leftover rice to make this Ubbu rotis. Serve me this rotis with some spicy chutneys, i can have without any fuss. Awesome dish. Amazing find, Valli. This roti looks like it is a very light weight roti and easy on the stomach as well. Great pick for U ! Totally new one for me . This is such an interesting find Valli. I came across one ubbu roti from Tamil nadu which is a deep fried poori made of rice flour. This one is really good. Perfect recipe to use up the left over rice and with peanut chutney, this must be so yum..
Because of this Mega BM, I’ve learnt so many types of rice flatbreads and love them all. I’ll have to this version of using leftover rice. Makes the roti look so soft. Such a nice find Srivalli and a superb way to use left over rice!And kudos on having made so many varities of Indian Roti! a great way to use leftover rice I found in this ubbu roti. loved the fact that you made all kind of rice rotis…. great efforts. Wow…what a brilliant idea to use leftover rice to make this ubbu roti. It will be quite handy for me as I struggle quite often with leftover rice and don’t feel like wasting it.